MobiVet is a platform that connects pet owners and veterinarians for general care, telemedicine and emergencies. MobiVet uses your location to connect you with veterinary care in your area. Within the platform users can get urgent care/triage, schedule regular treatment/appointments, home visits, and interactive telemedicine sessions. Geolocation – MobiVet will use geolocation to assist in coordinating pet owners and veterinarians. When accessing the platform, if you do not have a specific vet that you are using, MobiVet will connect you to the closest options based on your location. Registration – Registration will be required for pet owners and veterinarians. Creating a profile. Pet Owner Registration -Will require information about the pet(s) and the owners, address/location, payment methods. Veterinarian Registration – Vets will require practice information, educational background, training, specialties, types of animals they service. Telemedicine – MobiVet will need access for video conferencing. We will need to determine which integrate the most seamlessly across all platforms and for the user experience along with keeping costs low. Reviews – MobiVet will building in a reviews/rating system so that pet owners can inform their choices by being able to view the quality of other service the veterinarians have given along with rating their own experience. Veterinarians will be able to give reviews on the pet(s) so that other veterinarians will be aware of what their facing on their visit(s). MobiVet.com being a Marketing Site and Developing iOS and Android Apps versus Browser Based App optimized for mobile. Option #1: Browser Based Site – Cost $75k to develop, $50K to host and develop iterative versions and improvements. Option #2: Native App Development – $50k x 2 (iOS & Android). $40k to develop the back end. $5k to make splash page. Hosting Costs – $15k per year. Hosting Options – Hosting costs have gone down significantly due to cloud-based services (AWS, Google). Will the data be hosted with in the app or the web space? Improves contact time/wait time for pet owners and vets for treatment. Allows pets & vets to connect locally in new markets or in case of emergency when a pet owner is away from home or out of range of their vet. Telemedicine allows patients to get treatment in their own home. Using the platform to better triage/treat which would buy valuable time in case of concern/emergency. Learning curve – the platform will have to compete with search engines/directories as a go to for veterinary location. Competitive research and data have shown that mobile vet and transportation services exist but are not unified. With a unique provider in each area. MobiVet is a prime opportunity to disrupt an archaic field and capitalize on technology to improve the customer journey of pet owners, the accessibility of quality preventive and urgent care for pets and propel veterinary medicine delivery into an age of all things digital. 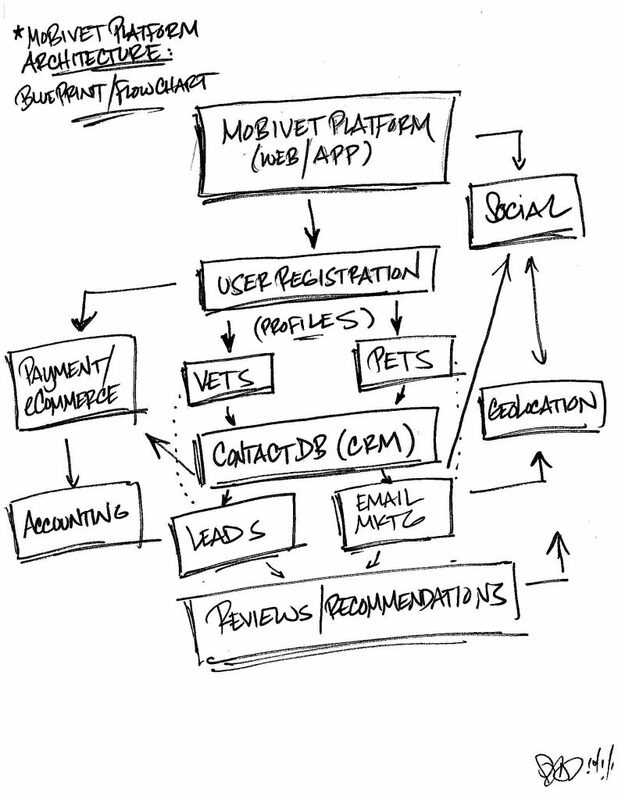 Developing MobiVet as a SaaS product to be used in veterinary offices. Growth as a system of record, which can allow for greater data analytics/research. Marketing growth using geolocation to cross promote with brands, clinics to expand brand awareness. Host/present streaming pet care seminars. Streaming classes for vet techs/assistants. WHAT IS THE IMPACT OR USER OF THE TECHNOLOGY IN THE MOBILE OR SOCIAL SPACE? The MobiVet platform is designed to advance the mobile veterinary space. It will impact users (both pet/pet owners and veterinarians), by creating an ease of contact between the two. It will empower pet owners to maximize the health care of their pets through they connectivity of their mobile device. It opens veterinarians to be able to work beyond the scope of their physical office and offer more hours of care (should they chose). Creates mobile marketing opportunities for veterinary clinics, and potentially pet care brands. SOCIAL – (I’ll defer here but feel free to add on).